Singing, what a wonderful way to worship our Lord, and praise His Holy Name!! 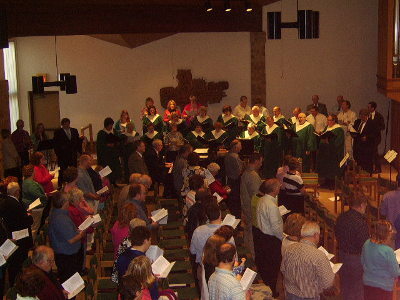 St. Mark’s has 3 choirs available to do just that. There is the Celebration Choir, singers being men and women raising their voices to the Lord in song. Lady’s voice parts are soprano, high soprano, and alto. Men’s voice parts are tenor and bass. The Celebration Choir has approximately 25 members and we always could use new, talented singers! Then there is the men’s choir; “Mark’s Men” is the name, with voice parts being, 1st tenor, 2nd tenor, baritone, and bass. If you like a Capella, you will like the Mark’s Men choir because we sing a Capella often. Our music ranges from classical, semi-classical, gospel, to contemporary and church hymns. We sing for the traditional worship services. Our choir season starts in September and goes until May with emphasis on the Advent season and Christmas, and the Lenten season and Easter. 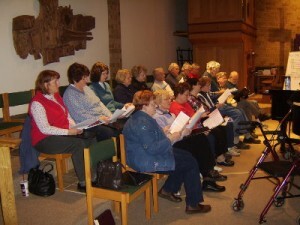 We also have a seasonal choir for men and women with limited time available to sing. Ella Holmes is the director.